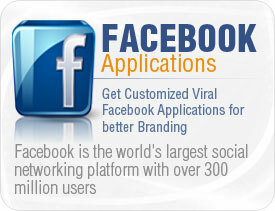 Get yourself socially branded with our Facebook applications and achieve your branding objectives. Create your viral and engage your customers with our exclusive iPhone application development services. Maximize your audience with our latest Android Application that ensures your social branding results. Target your niche with Blackberry applications for innovative and integrated solutions for your business. SocialFactory is the leading Social Media Marketing Agency that provides the best results you seek. Our enthusiastic developers make sure that your brand gets the best every time. That is why we offer customized application across any social platform. Your brand needs something more than an application. SocialFactory delivers a 360 degree solution for all your social media marketing objectives. We are beyond comparison when it comes to dedication, skills, talent and professionalism. SocialFactory has the team of best developers that produce results like no other. Recently launched new Kindle has began the new revolution in the category of tablet PCs. Kindle with its low weight and small size, is not only a tablet, but it’s a book, newspaper, blog, magazine, and even its your personal documents whenever you want to use it accordingly.